No visit to the Gascoyne region of Western Australia would be complete without an exploration of the breathtaking Francois Peron National Park. 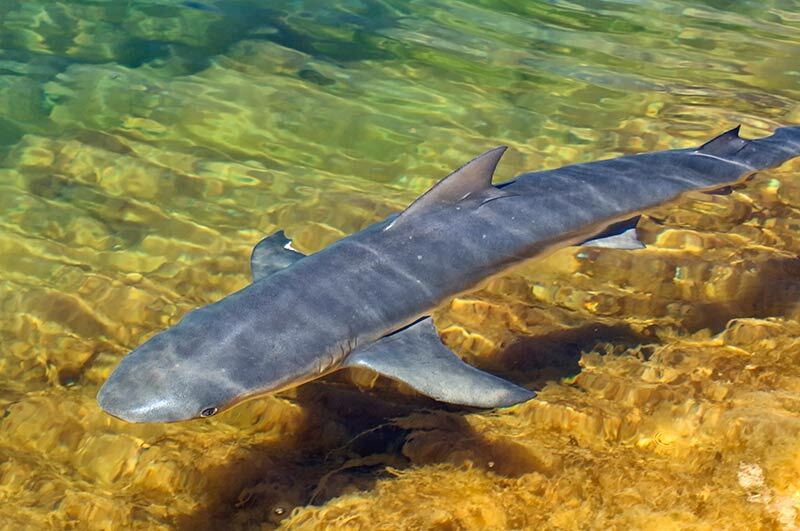 The Shark Bay World Heritage Area encloses some of Australia’s most stunning and important natural highlights. Protected to the east by the mainland and to the west by Dirk Hartog Island and a handful of finger peninsulas jutting into Denham Sound, the Peron Peninsula sits smack in the middle of it all. On the northern half of the peninsula is 52,500-hectare Francois Peron National Park; the only way to experience this absolutely splendid destination is by 4WD. If you are tenting it or travelling with an offroad camper trailer, you can stay in the park; if you have a caravan, you will have to do this as a day tour from Denham or Monkey Mia with an early start. Either on the way to, or on the way back from Francois Peron, there are a number of places that any visitor to the Shark Bay area should see. First up at 30km from the North West Coastal Highway turn-off is the Hamelin Pool Marine Nature Reserve, with a historic homestead and a telegraph station established in 1884. The natural feature here is a ‘pool’ or cove of hyper-saline water protecting colonies of stromatolites (an ancient form of microbial life) that can be seen from a boardwalk. The Hamelin Pool Caravan Park provides a pleasant place to stay if you have just completed a long day’s drive. Note that arriving at Francois Peron exhausted and in the dark is not a fun way to start a holiday. Further along Shark Bay Road, at 89km, is the turn-off to Nanga Bay Resort with camping, fishing and boating. This is a perfect spot to spend a few relaxing days. Across the isthmus is Shell Beach Conservation Park with a galaxy of tiny white shells crunching under your feet to a depth of 10m. This compacted material was once quarried as shell blocks for buildings, which can still be seen on the peninsula. As you continue on the main road, there are a number of lookouts such as Goulet Bluff, Eagle Bluff and Fowlers Camp, all of which are worth a look-see depending on how much time you have. And so, at 140km, you arrive in the little coastal village of Denham. To gain some insight into the astonishing amount of marine life you will see at Francois Peron, pay a visit to the Ocean Park Aquarium. The Shark Bay World Heritage Discovery Centre is most worthy of a visit, and the Parks & Wildlife Service office on Knight Terrace will be able to provide you with all the information you’ll need on Francois Peron along with an up-to-date park permit and camping fees. Most important of all, this is where you need to stock up on all supplies, including water and fuel, before heading for the park. If it is late afternoon, spend the night here and head into Francois Peron in the morning. If you are towing a caravan, you will need to leave it at one of the Denham caravan parks or at Monkey Mia. While Monkey Mia is not the rustic, remote experience it was years ago, it would be a shame to miss it and in spite of the busy (and expensive) Monkey Mia Dolphin Resort, camping beside the beach is still beautiful. Oh, and of course there are dolphins too, in case you hadn’t heard. Just 4km from Denham is the entrance to Francois Peron National Park. Francois Peron was only 26 when he joined the Nicolas Baudin 1801 expedition sent by Napoleon on a ‘voyage of discovery’. The crew spent 70 days in Shark Bay collecting 100,000 specimens representing 4000 species, an astonishing contribution to science and the knowledge of Australia. Peron also wrote about the Malgana people, the Aboriginal occupants of Shark Bay. From 1881, the Peron Peninsula was a sheep station and was grazed until 1990 when it was purchased and gazetted as a national park. With all that history, after you stop at the entrance to pay your park fee and camping fees, it is well worth stopping 5km along at the Peron Heritage Precinct. The display centre is informative, as is the self-guided walk through the old shearing yards and station quarters. The hot tub contains artesian bore water at a temperature of 44 degrees, and it is guaranteed that you’ll be yearning for this while at one of the five campgrounds, none of which have fresh water or showers. 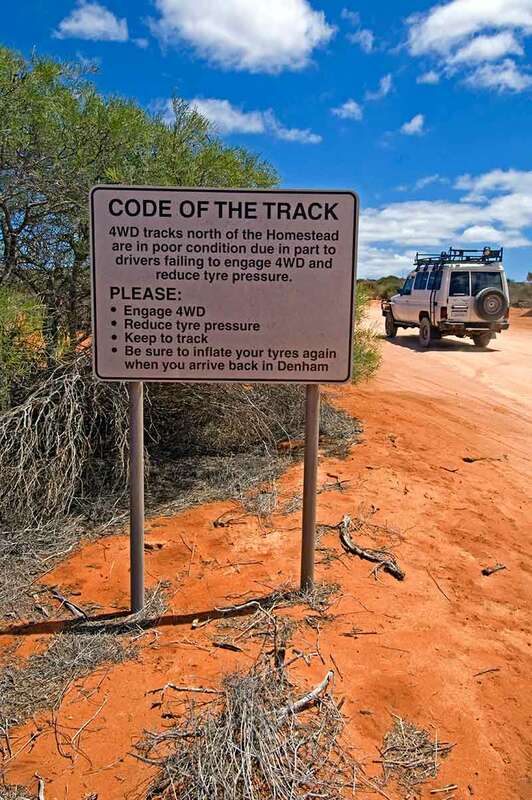 After a look around, it is time to engage 4WD and to drop the pressure in your tyres to something in the 20psi vicinity, depending on your load and preference. The long, red, narrow track ahead has soft, sandy ruts and the odd pull-out. Francois Peron National Park is 4WD-only. Take care because it is two-way; the speed limit is 50km/h. Stay on the main track and/or the tracks to the campgrounds; many of the old station tracks are now off limits for revegetation. Within 2km you will notice caution signs for both bilbies and mallefowl. This is evidence of the success of Project Eden. When the peninsula was turned into a national park it was over-run with feral animals and more than half the native species had vanished. With the help of baits and a fence across the isthmus of the peninsula, foxes were eliminated and other ferals reduced significantly. A program to re-introduce natives is in place, the bilby, woylie and mallefowl being among the first. So drive carefully, please, especially between dusk and dawn. If you are interested, the Atlas of Living Australia offers species lists for this region. At 3km from the start of the track is a turn-off to Big Lagoon on the west of the peninsula. It is 9km to the campground, and the soft, boggy sand will reveal quickly why caravans are not permitted in the park. Camping is near the lagoon with boat launching from the beach. The fishing is excellent, though it is not permitted within the lagoon; neither are any motorised watersports. If you are camping somewhere else, this is well worth a side trip to see the beautiful lagoon swirling in shifting shades of aqua blue. Artesian ‘hot tub’ at Peron Homestead. Back on the main track, it is about 19km to the start of the gypsum claypans. Heed the sign advising you to stay on the track: the crusty, salt surface of the birrida only appears to be hard and it doesn’t take much to get totally bogged here, something that any self-respecting 4WDer should avoid as it scars the landscape. So pick your way carefully through the tangle of tracks, not around them. Five kilometres on is the turn-off on the right to Harold Bight on the east of the peninsula. It is 6km to the campground, once again with deep, soft, sandy sections. You can also launch a boat from Harold Bight and it provides protection from the almost constant south-westerly winds. If you walk along the coastline, you’ll find a beach littered with the remains of shells from an early 1800s pearling camp. Harold Bight is also worth a side trip if you decide to camp elsewhere. The next campground turn-off, 8km further, is South Gregories on the west side of the peninsula. Gregories is next and offers some very nice snorkelling just offshore with a rocky shelf providing protection. The Bottle Bay campground turn-off, another 4km on, is the closest to the tip of the peninsula and Skipjack Point. These three are worth the short side trips of around 500m each, but you’ll need low range as the tracks have deep, soft ruts and in no time you can find yourself bogged. This is strictly scrubland, so don’t think there will be a tree to wrap a strap around! If ever a destination saved the best for last, it is Francois Peron because just 1km on is the car park for Skipjack Point. A boardwalk weaves out to two stunning lookouts over the Shark Bay Marine Park, where you can stand for hours and view a mesmerising display of marine life on parade. Sea turtles rise to the surface for air. Manta rays and stingrays speed through the water like commuters late for work. Bait balls roll furiously along and reef sharks follow with a slow, steady purpose. Dugongs might be seen feeding on the seagrass, the most expansive and varied meadows on earth and one of the most important factors in having Shark Bay listed as a World Heritage Site. Dolphins frolic. Pelicans bobble. Cormorants dive. A closer look reveals cuttlefish dancing about the rocky outcrops and a multitude of colourful fish one would expect to find on a coral reef. To the south-east, the view sweeps back across the red cliffs leading to Herald Bight and to the west is a cove with the 3km return Wanamalu Trail, an interpretive walk to Cape Peron North. Cape Peron North can also be accessed by road, 1km from the car park for Skipjack Point. These waters beg you to come in, but beware because two strong currents converge here, making it the only spot along the entire peninsula that isn’t safe for swimming. Diving and boating is permitted but spear fishing is not. So spend a few days here or as long as you can go with the supplies you have brought in (you can always scoot back to Denham for more, or over to the homestead for a spa). It is a truly magnificent spot. The final word on Francois Peron, and the entire Shark Bay area, is we wish we were there right now. Francois Peron NP is located on Western Australia’s Peron Peninsula, more than 700km north of Perth. Medical assistance: Shark Bay Silver Chain Health Centre in Denham. Phone: (08) 9948 1213. Caravans are not permitted. Offroad camper-trailers and/or dinghies are allowed. Contact Denham park office on (08) 9948 2226 for information on towing a hybrid van. A park entry fee of $13 per car, plus daily per-person camping fee of $11, is payable by cash or cheque at the entrance to the park. No advance bookings. Download the Shark Bay Visitor Guide for information and a map. Supplies: BYO everything and take all rubbish out with you. Stock up for your entire stay, along with a first aid kit, bathers, hat, sunglasses and sun cream. Waterproof sandals must be worn in the water as stonefish and cone shells are present in the shallows.